Compact and powerful central vacuum for homes up to 5000 sq. ft. Hybrid filtration technology; can be used with or without disposable filtration bag. 10 years on parts and 5 years on labour. Dial 1-800-361-3965 for details. Canavac's compact utility vacuum is a professional grade dry vacuum. With its 30 ft. reach hose and multiple accessories, cleaning up around your work area is a snap. The easy to empty dust bag allows you to empty the dirt quickly and with no mess! The easy install wall mount keeps the vacuum off the floor to maximize your workspace. This unit simply connects to any common 110 volt electrical receptacle. Canavac's workshop and garage utility vacuum is a professional grade dry vacuum. With its 30 ft. reach hose and multiple accessories, cleaning up around your work area is a snap. The easy install wall mount keeps the vacuum off the floor to maximizes your workspace. This unit simply connects to any common 110 volt electrical receptacle. Air Driven Turbine Carpet Nozzle The Cleaning Set Perfect partner. We were thinking that the real performance of a central vacuum system depends on the cleaning set. Electrolux central vacuum systems have been designed to fulfil the need for technically advanced products offering sleek design and highly effective performance. It is the built-in home cleaning solution giving you a easier, more enjoyable cleaning experience with the benefits of a healthier home. We were thinking that your central vacuum power unit should fit your needs be innovative, efficient and quiet by design. Superior performance with cleaner air built in. Made of solid metal construction guaranteed for life, the Electrolux Metal quiet clean line is strong and sturdy, yet elegant. Includes Complete Electrolux Premium Carpet & Hard floor Cleaning Kit. Designed for semi & detached homes / carpeted & hard floor surfaces. Electrolux central vacuum systems have been designed to fulfil the need for technically advanced products offering sleek design and highly effective performance. It is the built-in home cleaning solution giving you a easier, more enjoyable cleaning experience with the benefits of a healthier home. 651 Air Watts Central Vacuum Cleaner with Accessories and Electric Carpet Brush Compact and powerful central vacuum for homes up to 5000 sq. ft. Hybrid filtration technology; can be used with or without disposable filtration bag. 651 Air Watts Central Vacuum Cleaner with Accessories and Electric Carpet Brush is rated 4.5 out of 5 by 98. Rated 5 out of 5 by Dan67 from Excellent built in Vacuum system, lots of suction Easy to install and a great working vacuum system , It have very good suction power and comes with all necessary attachments , it light weight and has a 30 foot reach. Rated 5 out of 5 by Phil from It was easy to install and is simple to use.... It was easy to install and is simple to use. Runs very quiet, as advertised. Rated 5 out of 5 by Dee33 from Good Suction Bought this for my new home. Unit is a nice compact size not big and bulky and easy to remove canister. The suction on this unit will surprize you. what type of motor does this unit have? 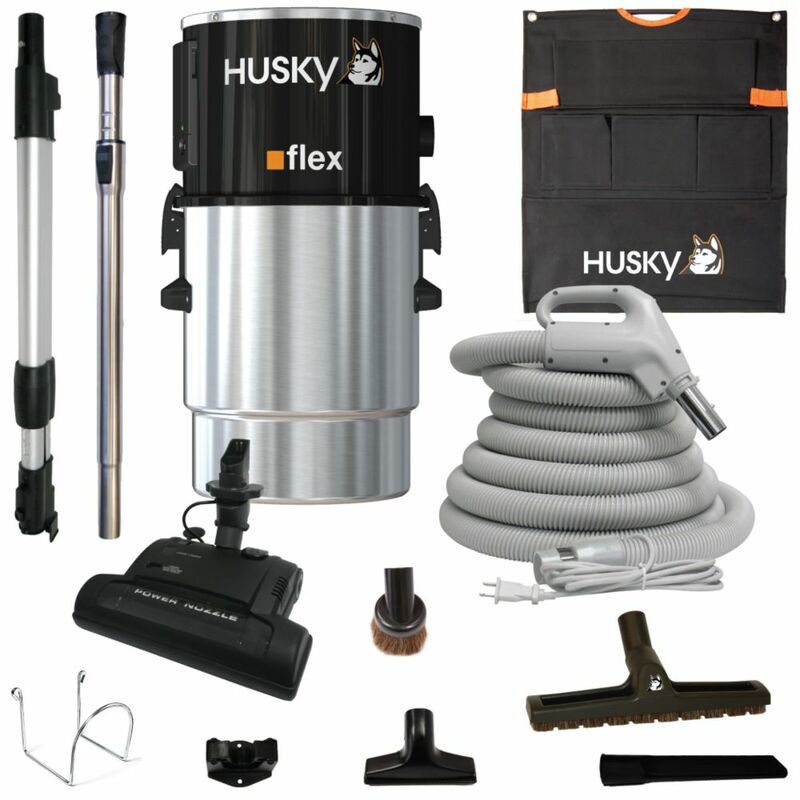 The Husky Flex is built with a top quality Thru-Flow motor. Do you have to call Husky technician to reset this unit after 500 hours of operation? Husky products were designed to be worry-free, durable and user friendly. All vacuum motors have parts that will wear out with normal use and will need to be replaced after a certain amount of run-time. Husky vacuums are equipped with an electronic circuit board that will stop the power unit after 500 hours of usage (approx. 10 years) to prevent costly repairs. The visible LED will indicate hours in advance that a required maintenance is coming and then stop at 500 hours. The vacuum can be restarted with a simple reset procedure using one button on the side of the machine.